I've been buying as much asparagus as possible lately, tossing it into my basket whenever I see a good bunch, then going back for a second batch. I cook it simply, tossed in olive oil and sea salt with an overly generous shower of roughly cracked black pepper on top. I love the pepper with asparagus; it's a trick I picked up from my mother-in-law, who served it to use this way at dinner a few weeks ago. That night I started with a few stalks, then served myself seconds and thirds and fourths, until my mother-in-law just told me to finish the tray, which I did. As easy as it is to cook asparagus, there are times when I don't get to it quickly enough and find with dismay that the once bright, crisp, greens stalks have given up on me, flopping over in my hand almost as if to say, "we couldn't wait any longer." And so I decided to be a bit more diligent, putting into action a trick I'd learned years ago from some lady at the supermarket, but which I'd never quite bothered to follow. And what do you know? It worked! Step 1: When you get home from the store or market, pull the asparagus out and trim off about an inch from the bottom, much like you would with a bouquet of flowers. The quickest way to do this is just to keep the rubber band on the bunch and run a chef's knife through the whole thing in one swoop. Step 4: Place the entire thing in the refrigerator, preferably closer to the back where it is coldest. Stored like this, the asparagus should stay fresh and crisp for at least a week, sometimes even longer depending on how fresh it was when you brought it home. Swap out the water if you notice it start to get a bit cloudy. 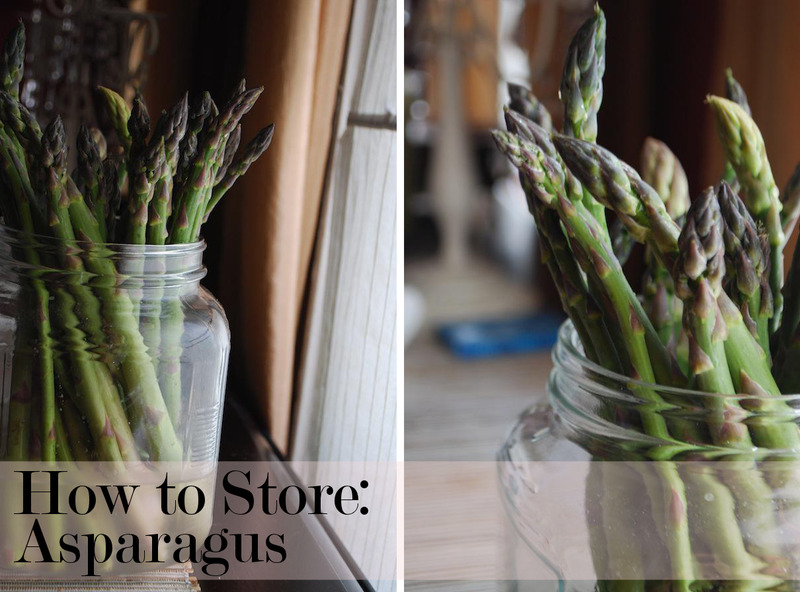 It is, of course, best to use the asparagus as soon as possible, but this is a great way to extend the shelf life and keep it from wilting before you are able to use it. Note: this trick also works really well for parsley and cilantro! Wondering what to do with that asparagus now that you know how to store it? You can make roasted asparagus, but my favorite is this Creamy Asparagus Soup with a bacon and asparagus tip garnish.